Hat, Binoculars (if you have some), Camera, plenty of film, Mosquito Repellant on sunrise and sunset cruises, sunscreen, tour ticket or correct change if paying on the day. Is drinking water available on the boat? yes, we always have cold water available for passengers during the cruises. Are toilet facilities available at the cruise? yes, there is a public toilet available in the carpark area at Corroboree Billabong, so please allow time to use the public toilet before boarding the cruise. Our main boat has a toilet available but our smaller boat does not have toilet facilities. Please advise us if you specifically require a boat with toilet to be available for your cruise. Yes, the boat has a full length canopy so there is always some shade available. Depending on your cruise time and your seat on the boat though, there is a possibility that you may be in the sun at some stage. We would definitely recommend bringing sunscreen on the 2.5 hour cruise. How long does it take to drive from Darwin to Corroboree Park Tavern? We recomend people allow a minimum of 75 minutes to drive the 84km from Darwin to Corroboree Park Tavern. This distance can be completed in 60 minutes on a good day at 120 km/hr but if you get caught behind a road train on the highway you will need extra time. Please note - There is still 21 km to drive from Corroboree Park Tavern to the cruise departure point at Corroboree Billabong. The last 4km of this drive is on unsealed road. What is the condition of the unsealed road from Corroboree Park Tavern to the cruise? there is 4 km of unsealed road to reach the cruise. This road is graded every 4 - 6 weeks and the condition is generally pretty good. The first 11km from the Arnhem Highway to Marrakai cattle station is a sealed road, turn here and it is 10km to Corroboree Billabong, the last 4km of this road is unsealed. What if i do not want to drive my vehicle on the unsealed road? If you do not wish to drive on the unsealed road, we operate a shuttle from Corroboree Park Tavern that departs 30 mnutes before the cruise times. The shuttle operates from April - Octobber inclusive and costs $5 return per person. Bookings are essential. Is there anywhere i can leave my caravan before driving on the unsealed road? yes, it is possible to leave your caravan at Corroboree Park Tavern. They have plenty of room available and are happy to offer this facility. Please ask for more details when making your reservation. What age does the child rate apply to? the child rate is available for children between the ages of 4 & 15 years inclusive. Infants/toddlers less than 4 years old are able to travel free of charge on cruises but are not permitted on the 1 day tour. Can we bring infants on the cruise? yes, but please consider other passengers as this is a nature based cruise in peaceful surroundings. You know your infant best and whether or not they would be content for the duration of a cruise. We would generally suggest the shorter duration cruises to be the most suitable option. What is for lunch on the 2.5 hour lunch cruise? lunches are healthy and consist of individual pre-packed fresh salads with dressings. They also have a selection of cold sliced meats and bread so people can make sandwiches if they wish. yes, but you will need to advise us of your dietary needs when you make your booking. Will we see crocodiles on the cruise? almost certainly, we rarely operate a cruise that does not see any crocodiles. The time of year and the time of day that you take a cruise will determine if the crocs are swimming in the water or sunning themselves on the bank. Will we see many birds on the cruises? yes, definitey. We generally see about 30 different species of birds on our cruises. Which cruises are best for birdlife? Generally speaking the early morning or late afternoon cruises are best for birdlife. In saying that, we see as much on our 2.5 hour midday cruise because we have time to cover a greater section of the wetlands than we can cover in the shorter duration cruises. These wetlands are only accessible from April to November. They are beautiful throughout this complete period with an abundance of water lilies, fantastic wildlife and plenty of birds. Wetland Cruises accept no responsibility for the loss or damage of personal articles. Wetland Cruises will not be held responsible for any personal injury sustained by clients due to actions beyond our control. 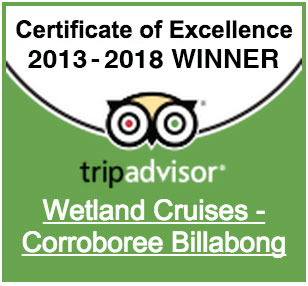 Subject To road and weather conditions, unforeseen circumstances and mechanical failure, Wetland Cruises reserves the right to cancel departures. Wetland Cruises also reserve the right to cancel a tour if the group numbers are not sufficient, in such cases full refunds will be given. Any costs incurred by a client as a result of a delay or cancellation, including failure to make connections with any other service, are the responsibility of the passenger. We strongly recommend that all passengers have their own travel insurance to cover losses. Cancellation fees are 10% charge outside 14 days, 25% charge from 14 –8 days, 50% charge from 7—4 days and 100% charge within 72 hours of departure.